Here are important Ecuador warnings. 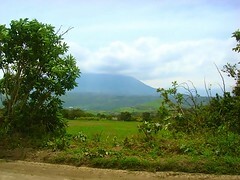 Ecuador is a beautiful country with warm, wonderful people. Yet like all great nations there are some places where you should not be and some people you won’t want to know. Merri and I have traveled all over Ecuador..by small planes…. private bus… taxis and with guides in private cars. For 4 years, we were extremely lucky to have the National Guide of Ecuador to help us learn all about this country. In this process we have learned great places to be and which areas to avoid. We also stay in touch with contacts nationwide to spot shifting patterns of crime and areas to avoid. Ecuador Warning #1: Be careful of dangerous areas. We have received increased reports about people being robbed in the Mariscal Sucre area of Quito. This is a popular tourist area that used to be our favorite to visit when in Quito but we advise delegates to be most careful there. The bus driver we have used for years would not even take his bus there. 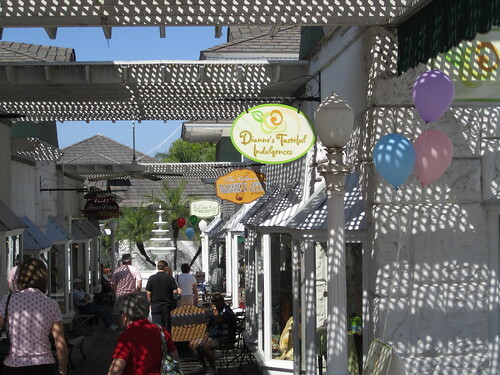 We used to love this area and enjoy the cafes and quaint restaurants like the one above. No more. The US State Department agrees. They have posted this warning: Quito: Stay particularly alert on the crowded streets of south Quito, at the Panecillo, the Historic District and in the areas of El Tejar, Parroquia San Sebastian, Avenida Cristobal Colon, and Gonzalez Suarez. Quito’s Mariscal Sucre district, a popular tourist area with numerous restaurants, bars, hotels, hostals and shopping sites, is increasingly a site of crimes; examples in the past year range from petty theft to sexual assault to shootings. In the Mariscal Sucre, travel in groups, avoid hailing taxis off the street or using unofficial taxis and exercise caution in the early morning hours. Due to numerous incidents in which U.S. government employees and private U.S. citizens have been victimized in the Mariscal Sucre, the U.S. Embassy has declared certain Mariscal Sucre bars off-limits and now enforces a nighttime curfew in the area for its employees. For example avoid the northern border near Colombia. The US State Department says: Due to the spread of organized crime, drug trafficking, small arms trafficking and incursions by various Colombian terrorist organizations in the northern border region of Ecuador, the U.S. Embassy in Quito advises caution when traveling in this region of Ecuador, including the provinces of Sucumbios, northern Orellana, Carchi and northern Esmeraldas. U.S. government personnel are under strict limitations with respect to traveling alone or over-nighting in these areas. If you plan to live in Ecuador… you’ll get to know the safe places and the areas that are not and how to act… just like anywhere else. 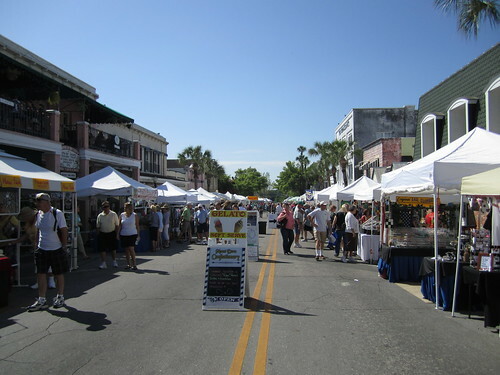 I recall when Merri and I lived in Naples, Florida. Criminals started picking on tourists (German and English mainly) in Miami. One German tourist was even shot on the Miami freeway. We learned quickly what to avoid and not… but the tourists did not know! In addition the Mariscal Sucre area is getting cleaned up. I am staying in Quito for a few days and will explore this wonderful news. A few years ago Colonial Quito was on our no go list. Now it is great… so these danger areas do change and we’ll keep you appraised. When you first visit Ecuador… you’ll be a tourist which means you need to exercise greater care. 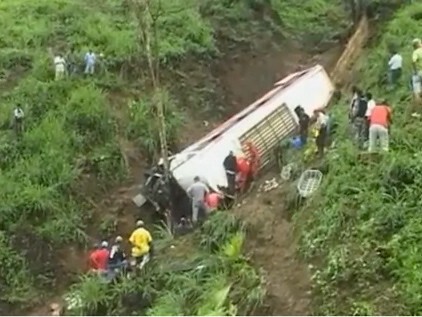 Ecuador Warning #2: Exercise extreme caution with public buses. 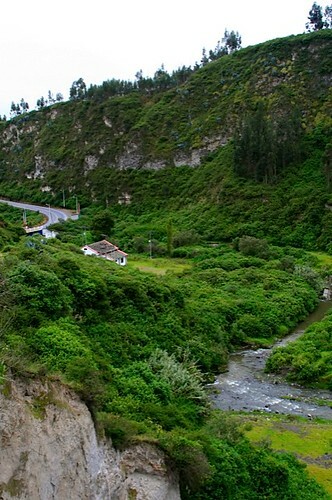 I was in Cotacachi when a public bus slid off this cliff killing many of the passengers. This road winds off the Pan American Highway down and then back up to Cotacachi. August 2010 Reuters News – A bus winding its way through Ecuador’s highlands toward the capital of Quito went off the road before dawn Sunday, killing 38 passengers in the worst accident of this kind in the country in years. 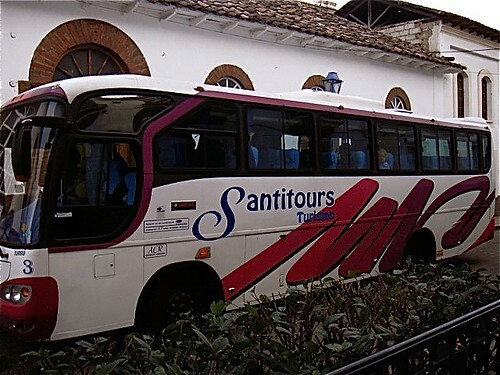 This bus was headed from Quito to Cuenca. 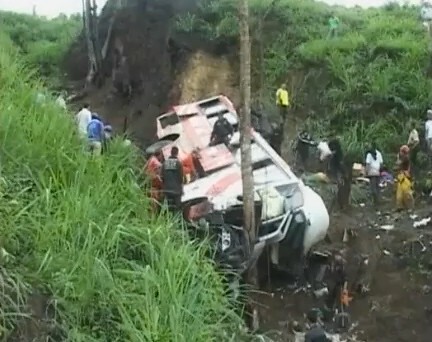 December 2010 RTE News – At least 35 people have been killed and dozens more injured after a bus plunged about 1,100 feet (350 meters) off a foggy, rainy mountain road in Ecuador, say rescue workers. 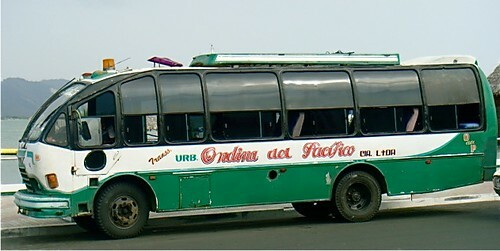 This bus was headed from Quito to the coast. The bus was designed to hold 40 people but had 80 and carried freight including a refridgerator. One reader recently wrote: Hello Gary, In one of your news letters, you talked about an executive bus service we could use from Quito to Bahia de Caraquez. Is this possible and would you recommend this? If so could you send information about this service? Thank you. Our advice is avoid public buses. They can be over crowded. Plus on public buses you increase your chances of being robbed. Bonnie Keough who conducts Ecuador export tours and Alberto Verdesoto, one of the most experienced tour guides in Ecuador both had their bags fished along the floor from behind them and emptied as they traveled from Quito to the Amazon by public bus. This is not unique to Ecuador. My nephew decided to visit me us in Florida and came by Greyhound from New York. He was robbed of everything and I suspect I would offer the same advice for traveling across the USA… avoid public buses. The Ecuador real estate tours… the Ecuador shamanic mingas and Ecuador export tours all use private tourist buses from Morya Discovery. Radio called cabs are so inexpensive, they offer a great inexpensive form of local transport. Ecuador Warning #3: Avoid Triple Dipping. 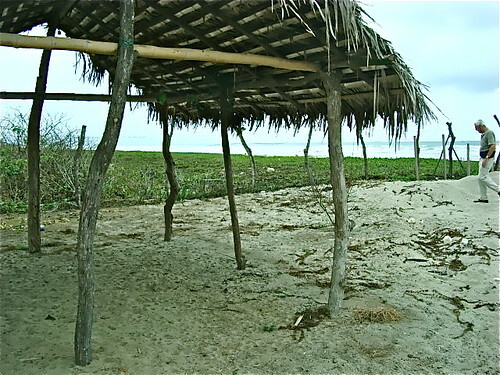 See how to save up to $78,000 on Ecuador Building lots like this. The Dangers of the Triple Dip. 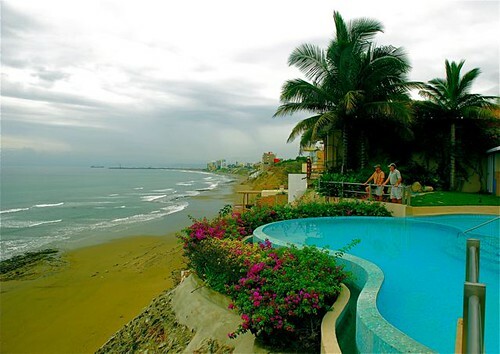 Don’t be ripped off in an Ecuador real estate scam. Our business has shifted from encouraging readers to come to Ecuador to helping them avoid paying much more than they need to pay. In the past decade many people have set up shop as brokers and or developers. There are no licensing laws so many of these can do just about anything they please. One such scam is triple dipping. Recently I received this note. 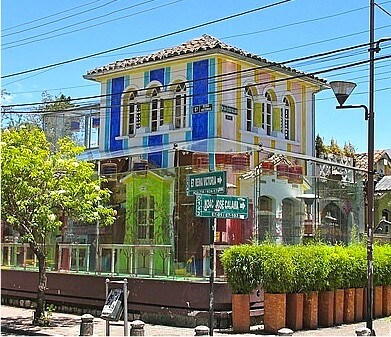 Gary, Interestingly I met with a prominent Ecuador attorney last week and he mentioned that a real estate broker recently came to him looking for referrals. He was uncharacteristically candid with the broker and said that the broker’s practice of collecting from both sides and inflating prices in order to get a larger commission prevented him from referring clients. To this the broker suggested having the spouse represent the seller and the broker the buyer. Clearly integrity is not high on this broker’s list of priorities. Triple dipping is quite simple. The person offering the property for sale stands between the seller and the buyer. The broker increases the price the seller really wants (and keeps this difference) PLUS charges both the seller and buyer a commission. In addition when you buy… ALWAYS APPOINT YOUR OWN INDEPENDENT ATTORNEY. I cannot express the importance of this action. One benefit we have with over 22,000 subscribers and thousands of them in and out of Ecuador is a wide perspective of what’s going on. 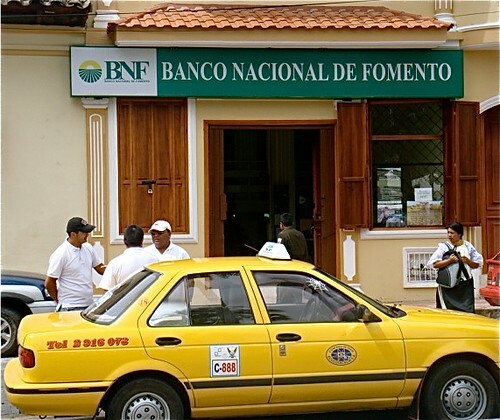 We learn quickly about unethical activities from notes such as those above.We share with our Ecuador premium subscribers what we learn, plus have a list of attorneys across Ecuador who have served our subscribers well. See how to subscribe to our Ecuador Living service here.